What about the nuclear waste? What about all the toxic stuff at Hanford, in Washington, and the Navajo uranium miners? What about the tritium that sometimes leaks from nuclear plants? What about "mutant daisies," "irradiated oceans," a "million dead from Chernobyl," "thyroid cancer from Fukushima" and other scary-sounding things? Is fear of radiation harmful? Does nuclear energy lead to nuclear weapons? How do we know we can trust the federal Nuclear Regulatory Commission (NRC)? Why then are people so afraid of nuclear energy? What are the consequences of exaggerated public fears of nuclear energy? Nuclear is the safest way of producing reliable electricity, according to every major scientific review, including the British medical journal Lancet. What all of these studies show is that over 95 percent of the deaths from energy production are from pollution. A tiny number are from accidents, whether coal mine collapses, natural gas explosions, or nuclear meltdowns. As such, zero-carbon energy sources in general, from hydro to solar to wind to nuclear, result in very few deaths. By contrast, the World Health Organization estimates 7 million premature deaths each year from air pollution caused by burning fossil fuels and biomass for energy. 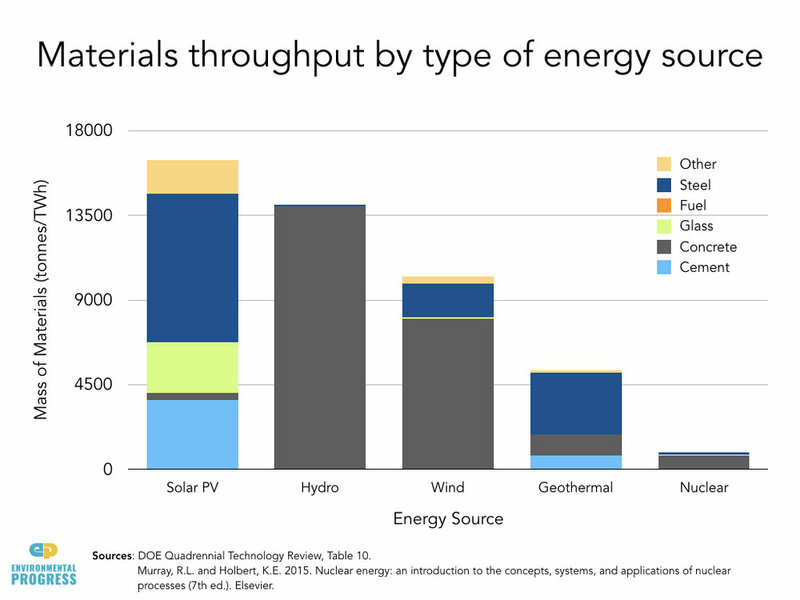 Replacing these sources with non-polluting nuclear-powered electricity would save millions of lives every year. Nuclear waste is the best kind of waste from any form of electricity production. First, there is very little of it, and it is easy to manage. What people are referring to when they talk about nuclear waste is the former uranium fuel rods. All of those rods stored in the same place would fit on a single football field stacked 50 to 60 feet high. Currently, nuclear waste is stored on-site, largely because opponents of nuclear power have opposed the construction of a central waste storage facility. In the future, after Congress passes bipartisan nuclear waste legislation, it will be transported and stored underground in New Mexico or another state that wants it as a source of income. Both Hanford waste and Navajo uranium mining were consequences of the rush to develop nuclear weapons, not nuclear energy. The improvement of uranium mining occurred through the development of a well-regulated nuclear electricity sector, and has gotten better and better every decade. The tritium leaks from plants like Vermont Yankee and Indian Point epitomize the mythology that radiation is a super-potent toxin. The graph on below shows how little tritium leaked from the "worst" tritium leak ever in the US. It was still an order of magnitude less than the EPA drinking water limit. All are myths. Those mutant daisies are in fact something called "fasciation" that is a mutation, but not one caused by radiation. There is no elevated cancer in Fukushima. There is radiation in the oceans and everywhere else and they are at levels that do not harm anyone or anything. As for the "million deaths" lie about Chernobyl — it's not only pseudo-science, it's psychologically harmful to people who live in the region, and promoted panicked reactions like the one that left about 1,500 people dead in the over-evacuation of Fukushima. Yes. The World Health Organization research shows that it was the fear of radiation, not the radiation itself, that caused physical harm to people near Chernobyl and Fukushima. The panic was created by fear-mongering and thus was avoidable. No. And in fact, the opposite is the case. Nuclear energy has been essential to dismantling nuclear weapons, and until a few years ago, a full half of the nuclear energy in the US was produced using plutonium from de-commissioned warheads. There is no case where a nation acquired a nuclear weapon through nuclear energy. The reason for this is is easy to understand. Nations seeking nuclear power plants must agree to the Non-Proliferation Treaty and regular inspections by the United Nations, which thus makes acquiring nuclear energy an obstacle to proliferation. Nations do not need nuclear power plants to pursue a nuclear weapon and indeed, as in the case of Iran, choose to build medical research reactor rather than a full-blown nuclear power plant. The NRC is independent and effective, and is considered one of the best regulatory agencies in the world, in large part because of the special way it was created. NRC is governed by a bi-partisan chair and commissioners selected by the President and Congress. NRC has resident inspectors in every nuclear plant who report to NRC headquarters. NRC staff are well-trained, high-status and well-paid; they often work at NRC for their entire career. It is overseen by the US Inspector General, which enforces laws and strong ethics rules. Both NRC staff and nuclear plant workers have whistle-blower protections that go above and beyond other industries and regulatory agencies. NRC has a unique process, known as Differing Professional Opinion, that allows NRC staff to raise issues without fear of retaliation and insures that their concerns will be vetted at the appropriate level. Fear of nuclear energy has developed for a variety of reasons ranging from association with nuclear weapons to mutant creatures in science fiction. The most persistent cause, however, began in the 1960s when environmental groups decided to oppose nuclear power. Originally, their concerns about nuclear had nothing to do with safety or waste and everything to do with opposing economic growth and in-migration to California. Their explicit strategy was to prey on public misunderstandings of how nuclear power works, exaggerate the amount and risk of nuclear waste, block disposal facilities, and conflate nuclear energy with nuclear weapons. Paradoxically, early environmental leaders like Sierra Club Directors David Siri and Ansel Adams, supported nuclear power as the best means to achieve universal prosperity, avoid dams on America’s scenic rivers and leave more room for nature.